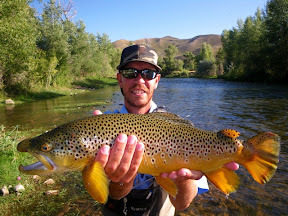 Summer is the glory season when it comes to fly fishing in Utah and for that matter many places. Summer is the time of the year of warm, pleasant days and sunny skies. Of course it can get quite hot in the lower elevations populated areas such as the Salt Lake valley. Unlike many places where the only relief from summer heat means sitting inside under an air conditioning vent, the cool waters of the Provo River, Weber River and other area streams are a short drive from the Salt Lake and Park City areas. There is no better way to beat the heat than wet wading upstream through a small mountain stream, throwing foam hoppers tight to shady undercut banks. Here in Utah, there are no “dog days of summer”. Some of the best fishing of the year can be experienced during the hottest days of August without a cloud in the sky. Summer is without a doubt the most exciting and most diverse time to fish here in Northern Utah. Not only is the fishing incredibly good and consistent, but also there are a plethora of waters to fish. We may not have large, famous rivers (other than the Green River of course), but we do have a myriad of small remote streams to explore. The streams may be smaller to medium sized, but that doesn’t mean that they don’t hold large fish. Quite the contrary, they hold numerous species of trout that can grow to be as large as fish in rivers 20 times their size. Brown Trout are still the most prominent species found in smaller streams throughout Utah, numerous other species are also present. Rainbow and Cutthroat trout are also common, as well as Brook Trout, Mountain Whitefish, Tiger Trout (brown/brook trout hybrid), Splake (brook/lake trout hybrid), and even Arctic Grayling. The upper stretch of the Provo and Weber rivers, as well as the South Fork of the Ogden River contain all of these species and it is realistic to get a super slam (all species landed in the same day) on many of these waters. Some of the better remote waters in northern Utah are Currant Creek, Strawberry River, Ogden River, Blacksmith’s Fork, Logan River, Diamond Fork, Duchesne River, American Fork Creek, Thistle Creek, Bear River, Fish Creek, and Rock Creek. These streams range in size from a moderate leap to cross, to 40 feet or so across. Many of these streams are freestone rivers that drain large expanses of high elevation terrain. Combine a long runoff period and difficult access in the winter and you see why summer is when these streams shine. Utah’s rivers and streams produce some of the best fishing you will find anywhere when many rivers in other areas are plagued with warm water, lethargic fish, and flotillas of rafters. Summer is like having several seasons rolled into one. Summer starts on most rivers with lots of cold, dirty water running off out of the mountains. Runoff on most normal water years starts in mid-late May and usually lasts into late June, but on very wet years, runoff can continue well into July. Runoff does not always mean that fishing is futile, but you definitely have to adapt and adjust techniques to meet the conditions. Many of the rivers we fish are tailwaters (rivers flowing from a dam). Tailwaters not only regulate water temperatures, but the impoundments above collect all the dirty water coming down from the mountains and keep the water clearer than freestone rivers, even during extremely high flows. During runoff you can encounter some interesting scenarios including higher water washing all sorts of land-based insects into the river. Various types of worm species make up the majority of this annelid “hatch.” The stronger flows will also push fish tighter to the bank where they can conserve their energy. This sets up an ideal situation for very productive nymph fishing. It may not be graceful, but fishing down deep in secondary holding water with worm imitations during high water can yield some of the highest catch rates of the entire year. Needless to say, the San Juan Worm is one of the most important flies to have in your fly box in early summer. As the waters of runoff recede, this gives way to the best insect hatches of the year. Hatches can be as varied as they are intense. Pale Morning Dun and Green Drake mayflies; various Caddis; Golden, Yellow Sally Stoneflies; Salmon flies, and certain types of terrestrials (such as cicadas) can all be found in huge numbers in early to mid summer. Nymphing as usual is highly productive, but this is the time for dry fly fishing. On tailwaters where mayflies and caddis dominate, classic hatch-matching techniques will be successful. Working on slack line presentations and down and across presentation casts will yield the best results. Fish in heavily fished tailwaters such as the Provo River have dry flies drifted across their nose every day. Covering the water with big bushy attractors will yield lots of spooked fish in these places. Scaling down fly size, tossing more exact imitations, and working individual fish will ensure that your fly spends more time in a fish’s mouth than in the bushes. As July gives way to August, caddis take the place of mayflies and stoneflies in the hierarchy of trout food importance. Because caddis are more active early and late in the day, it becomes more important to get on the water before the sun does and head back to the truck well after evening has given way to night. August nights are the season of headlamps and the sound of large brown trout gulping mats of mating caddis into the darkness. While summer mornings and evenings are the marquee times for hatch fishing, there are still plenty of dry fly opportunities to be had throughout the day. As summer progresses, terrestrial (land based insects) become more and more active and abundant. Any angler, who has had a very large fish smash a big foam hopper in water barely deep enough to cover their wading boots, will testify that few things in the sport of fly fishing can be as exciting. Utah is an arid state with a dry climate that creates an ideal habitat for numerous terrestrial insects such as grasshoppers, ants, cicadas, etc. On many of the smaller northern Utah streams, these insects make up the bulk of the food source for most of the fish. One of the biggest mistakes that many fly fishermen make when fishing big terrestrials is fishing too light of a tippet. Bulky, wind resistant flies need a stiff, heavier leader to effectively turn the flies over. Fish feeding on these insects are feeding opportunistically. Rarely, if ever, are they going to shun a large, rubber legged foam hopper imitation because of the tippet. Switching from 4 or 5X tippet down to 2 or 3X will give you the necessary stiffness to turn over the fly and present it correctly. The endless twisting of light tippet causes endless rat’s nests and weakens the line. A strong, stiff leader will stand up to line abrasion consistent with fishing flies tight to the banks as well as hold strong when a big fish makes a run into the cover that he just dove into. As gear, clothing, and access have improved over the years, fly fishing has become more of a four seasons sport. Many of the access points we fish during the winter were inaccessible to anglers 20 years ago. Today’s younger generation of anglers doesn’t even realize that in years past there used to be an actual fishing season that ran from spring to fall. This doesn’t change that fact that we, as anglers, still stew in anticipation of the summer fishing season. It never seems to get here soon enough and passes us by sooner than we would like every year since summer is the season of opportunity. Utah offers us so much for diversity and many of those options are only available in the summer. Snow blankets the backcountry for much of the year. So our best piece of advice for fishing during the summer months is to get out and fish as often as you can and as much as you can. Utah is a fantastic destination for anglers and summer allows you the best time to sample all of those flavors while they are at their peak.